Abutting Deerfield Academy campus, this quintessential 1824 New England style church has been the spiritual and historic center of Deerfield for most of its existence. While the church and its 1890s organ had served the congregation well, they were in need of work. Congregants Jean and Wayne Turner along with then organist Lynn Edwards (co-founder of the Westfield Center) spearheaded the organ project. The original church was restored as faithfully as practical, but the later organ was deemed to have been altered too many times to make a restoration possible. Our instrument is again in the balcony, which affords little height or space for an organ. 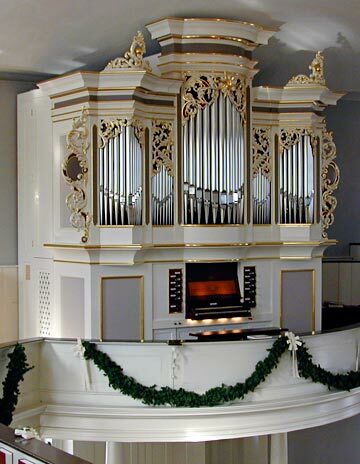 In researching options for such a situation we looked to the small village organs of Thuringia, Germany often built by Hildebrandt or Trost. Visually, the expanded cornices compensate for what is only a 6 foot façade in a fourteen foot tall case. 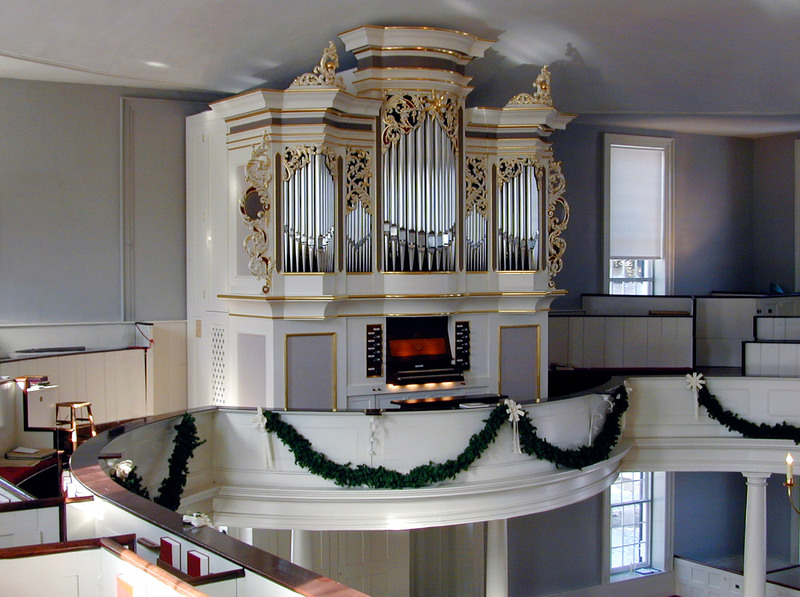 This organ also has both manuals on a single chest with manual I pallets accessible by removing the front skirts just below the façade pipes. The addition of a trumpet 8 on the second manual rounds out the Thuringian stoplist which enjoys use as a service instrument, a regular recital instrument and the background for numerous weddings performed in this historic venue.